Basic Furnace teaches students how to identify, maintain, and trouble shoot the most common heating and air conditioning systems encountered while performing weatherization measures. Students leave with an understanding of ventilation requirements for combustion appliances, as well as a firm grasp of the health and safety implications of improper installation, maintenance, and use. The course follows the Department for Energy’s standardized curriculum for Heating Systems for Energy Auditors/Inspectors and aligns with HVAC tasks under the NREL Job Task Analyses for Energy Auditor and Quality Control Inspector. The structure of the course includes lecture, dialogue, and practical experience through hands-on skill sets. This is a lecture-lab course focused on "hands-on" learning in our state of the art furnace training facility. Students will learn topics in the classroom and then immediately apply those concepts in practice on actual working furnaces. Student participation in discussions in the classroom and in the lab exercises is very important. This course has a written final exam and student participation is graded as pass/fail. 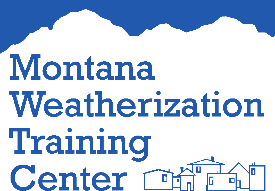 For additional information, please contact the Center at classes@weatherization.org or you can call (406) 586-0004.